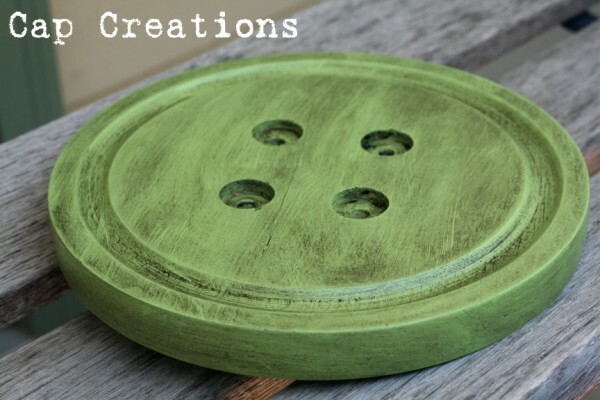 Remember the cheese dome and how I used the bottom part to create this over sized button? Well lets take a look at what I did with the top of that cheese dome. Couldn't have that top part going to waste! Here's what I started with. 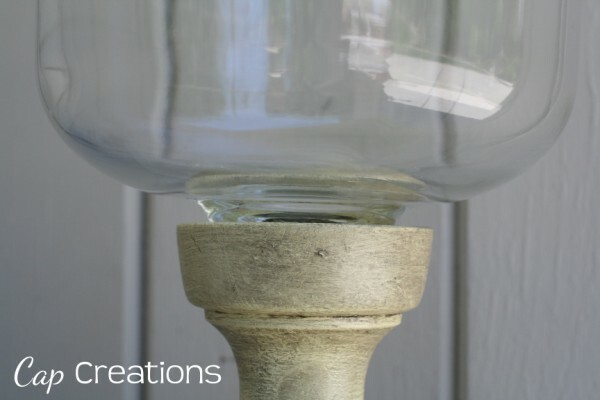 To the glass cover I added this chunky wooden candle stick. First I made the candle hole larger. Large enough for the handle of the dome to fit into. I painted the candle stick and antiqued it. Lastly I glued (E6000) the cheese dome upside down to the candle stick. And Walla! 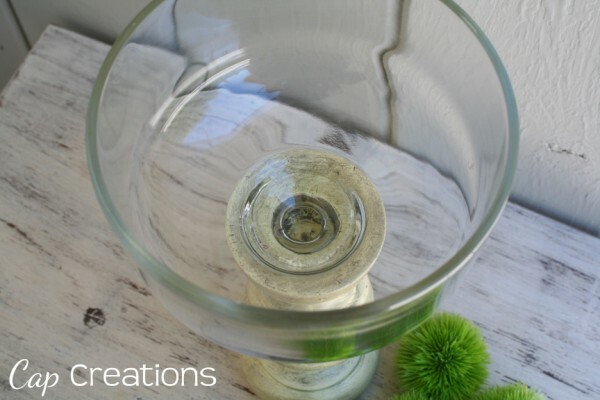 A lovely pedestal bowl! Totally love how this one came out! And love my little thrift store balls in there! All parts for this piece were picked up at the thrift store! Yeah way to up-cycle! Go me! lol! Just a shot of the inside, glued part. And from another angle just in case you need details! Ahhhh! So pretty! Do you want one? Wonderful!! I love how you did this and it can now be used for so many things! Awesome!!! What a great way to use all of the items? So inventive and looks FAB!!! This turned out so pretty! And...I love those little green things you popped inside. Gorgeous! Looks like it came straight out of a Pottery Barn magazine. 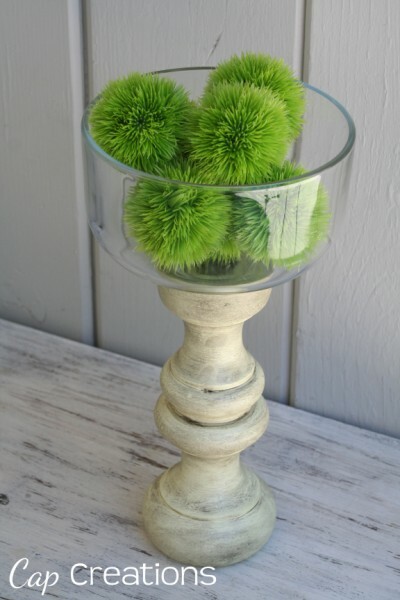 I LOVE the thrift store balls you threw in, haven't really seen anything like that but I am really smitten with them! Thanks for the comments ladies! Love hearing from ya! @Tonia- Totally! Thought about posting pics of the many different ways I can use this. @Mrs. Brady- None to waste!!! 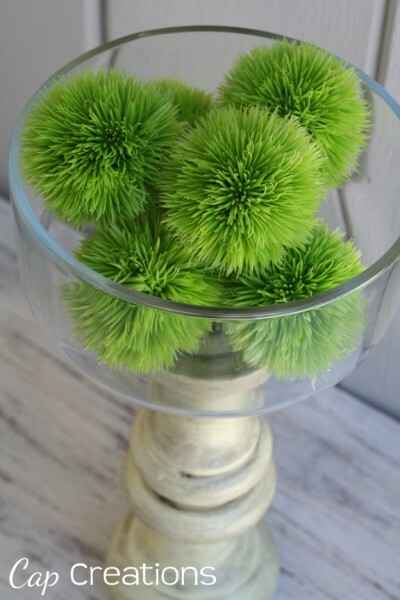 @Shelia and Jennifer- Fell in love with those balls the instant I saw them. And only a buck for all 7! They are like grass into a ball. @Petie- Just do it girl! Lets see what you come up with! Very creative! I have several of those domes and never would have thought to turn them upside down! Thanks for sharing! I'm going to feature this tomorrow. Now that is creative! Lovin' it! Looks great! 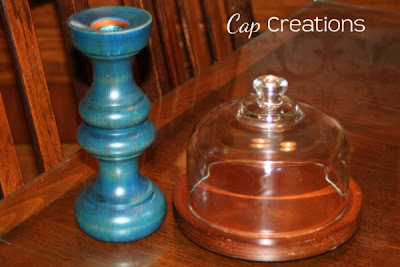 I've been collecting candle sticks and glass pieces from the thrift store to make up a few of these things for myself. I love this! It looks so affective! Lovely! Applause, applause! Yes, I want one now! I was thinking about your button project the other day and wondering where I had seen it. I'm so glad you linked to FJI. This turned out awesome! 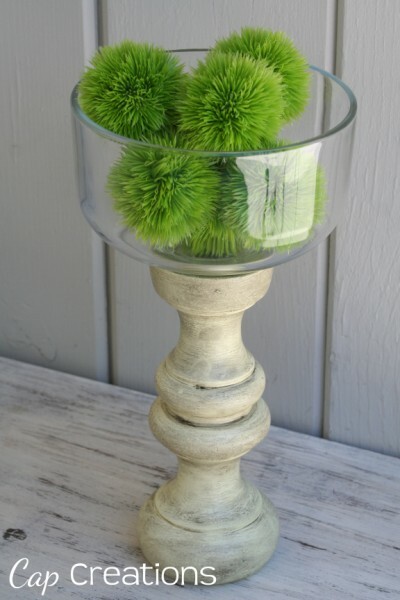 I love the decorative green balls in there too! Hi there I'm visiting from Tidy Mom. I absolutely love, love, love this project. Now I know what I need to be on the look out for when I go to the thrift stores. I've seen them often and couldn't think of what to do with it. Thanks for sharing. Yes, I want one! I think I have everything to make one for myself. Thanks for the inspiration. That is seriously creative! I love this!! What a great repurpose. Love it! Thanks for linking up to That's The Ticket.